This blog mainly reports on how UK pedestrians are regularly ignored, insulted and treated with contempt and also about the wonderful things that people in this country are doing to challenge this sorry situation. However, a comment on this blog yesterday alerted me to an appalling story in the USA where a mother, who’s 4yo child was killed by a hit-and-run driver as she crossed a busy road was found guilty of ‘vehicular homicide‘, an offense which seems to be primarily used against reckless drivers who kill but in this case was used again a pedestrian and who could have got a 3.5 years prison sentence. In fact she got ‘only’ got 40 hours community service and the chance of a retrial. 1) There is no provision for people to cross the road from the bus stop she used to the set of apartments opposite. 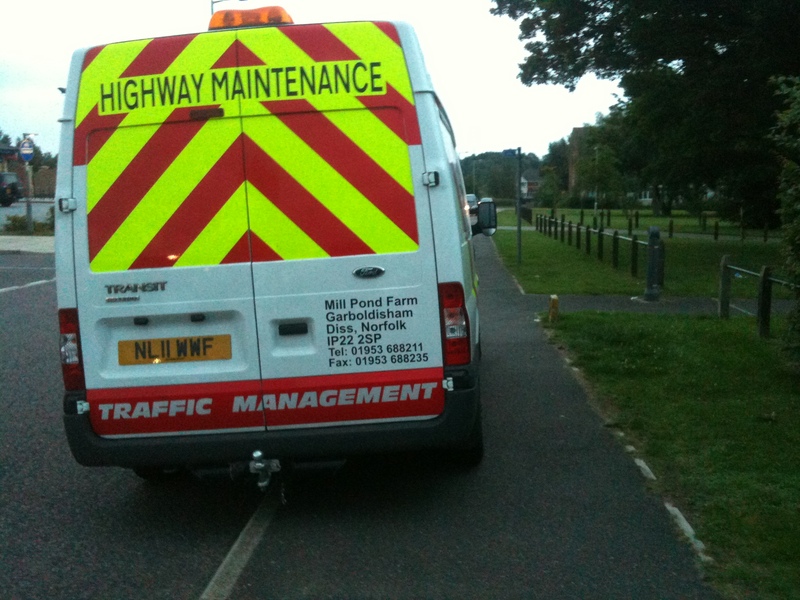 2) The road is a dual-carriageway and probably has a 45mph speed limit. 3) The transport authority is claiming that people should not cross the road, but should instead take an 800 meter diversion to use a proper crossing. 4) The jury has made up of people who didn’t use public transport or walk beside busy roads. To me this an extreme example of ‘autocentric‘ planning and attitudes which resulting in everything being considered primarily from the motorist’s perspective. 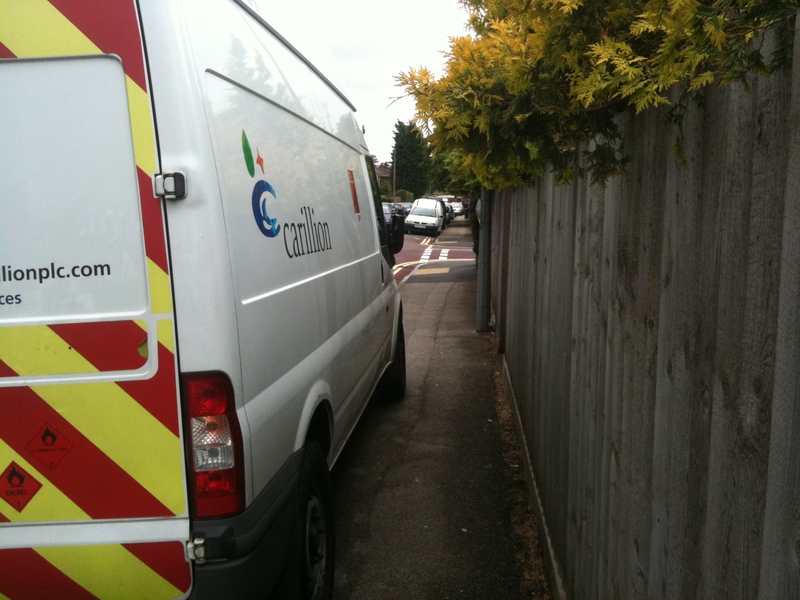 We see the same thing here where motorists park across the pavement to avoid inconveniencing other motorists, where maps fail to show footpaths because they are not relevant to motorists, where bins are left on the pavement by councils to avoid be sued by motorists, where signs warning motorists of diversions actually cause pedestrians to ‘divert’ into the road, and when the police arrest blind people in minutes as soon as they say they will deflate the tires of a car parked repeatedly across the pavement having failed to act on earlier requests from that person to get the motorist to stop parking there! All of the above results in the perpetuation of the ‘oppression’ of pedestrians. What is great is to witness a huge global movement growing made up of people demanding that things change; not least, Ken Edelstein, from the Green Building Chronicle in Atlanta, who is doing a great job pointing out the injustice of this particular incident and showing how things could so easily be done differently in future. 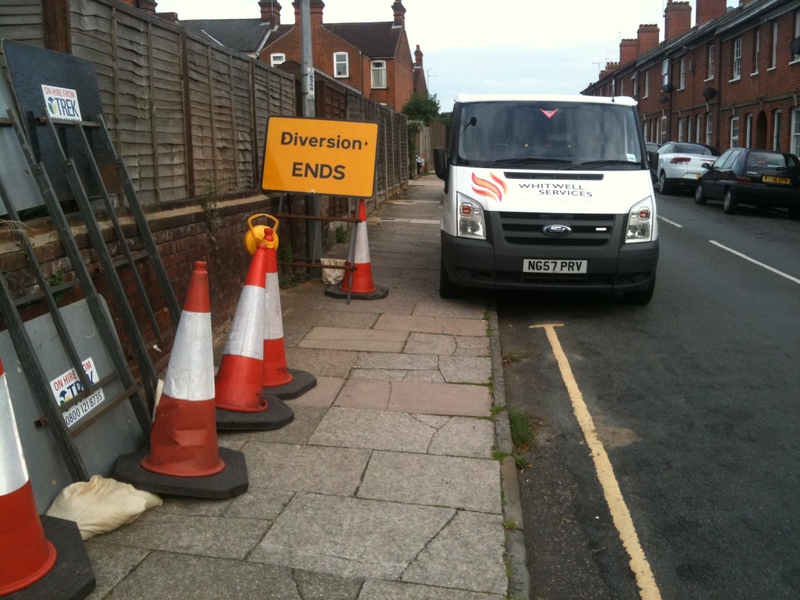 The sign says ‘diversion ends’, however for pedestrians the diversion onto the road in Ipswich to get round the signage and the vehicle is just starting. 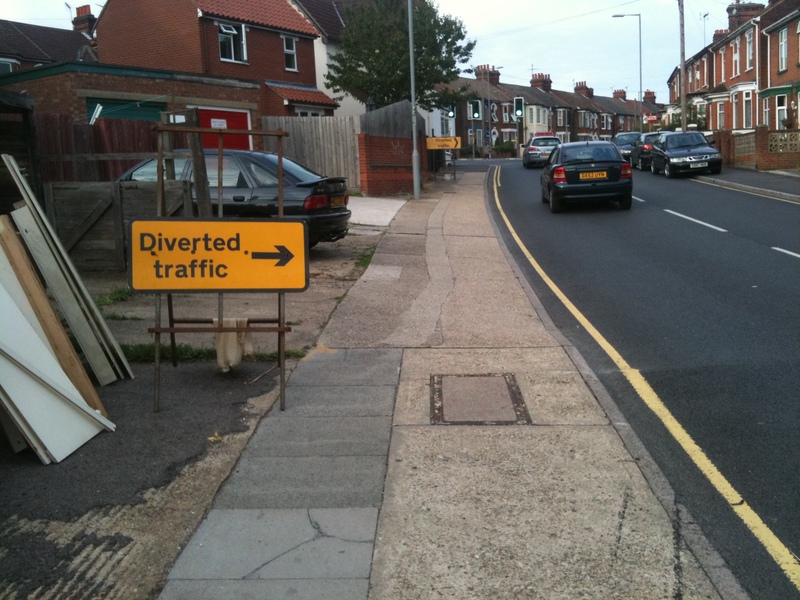 Putting signs across the pavement like this is thoughtless and unnecessary, and there are plenty of other ones in the area as you can see below. 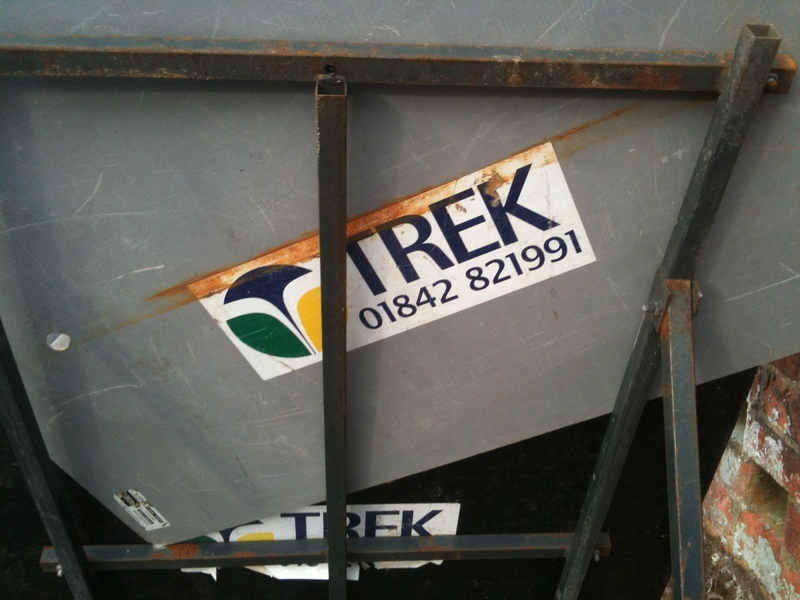 We can thank Trek Highway services Ltd this time. 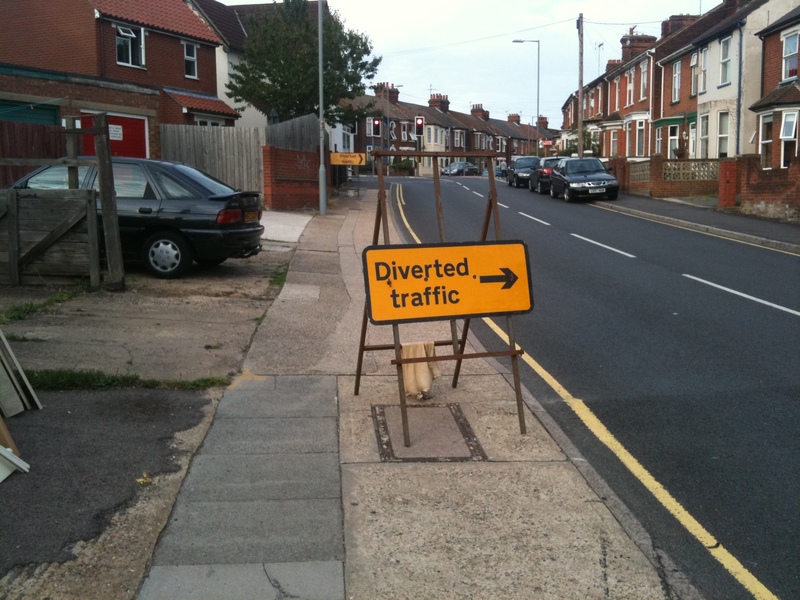 Let’s put this sign right across the pavement! 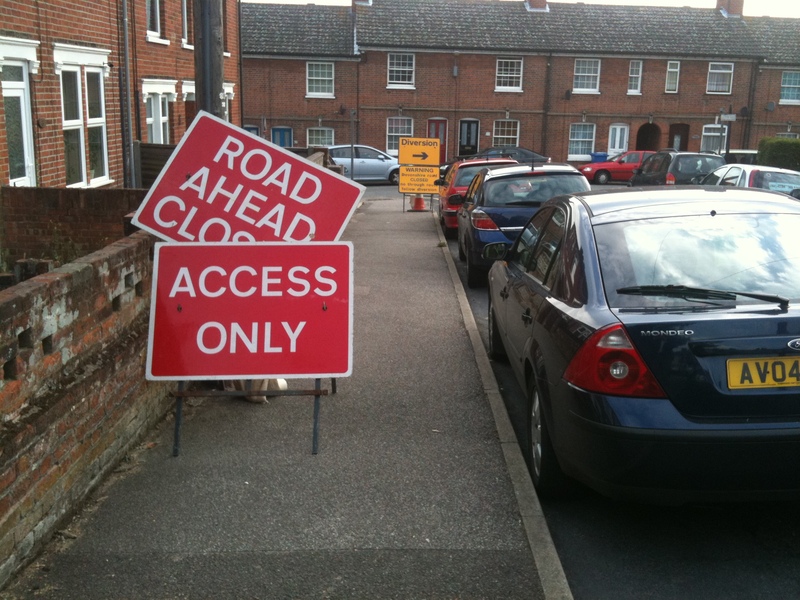 Pioneering pavement parking ban for Welwyn Garden City? Great stuff, especially as Welwyn Garden City was designed with every road having wide grass verge with a central parkway which was once described as one of the world’s finest urban vistas! Indeed it still is very pretty as shown below, but do notice the car tracks across the verges in the foreground. Not major at present and possibly there are worse problems elsewhere, but it is best not to drive on a garden! Preston City Council has announced that it will remove bins left permanently on the pavement and charge people for their return. They approach will be to first leave yellow stickers, then a red ones and then confiscate them and charge the owners £11 to get them both. 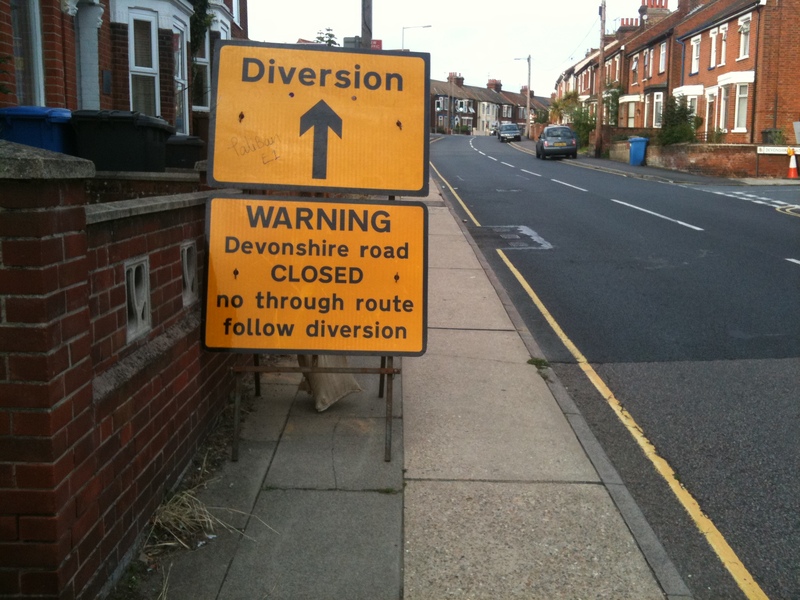 Both the labour and conservative groups support the move; deputy leader, Councillor John Swindells explained: “People have complained bitterly about them being out on the streets all the time.. we have tried with education and neighbourhood management teams. 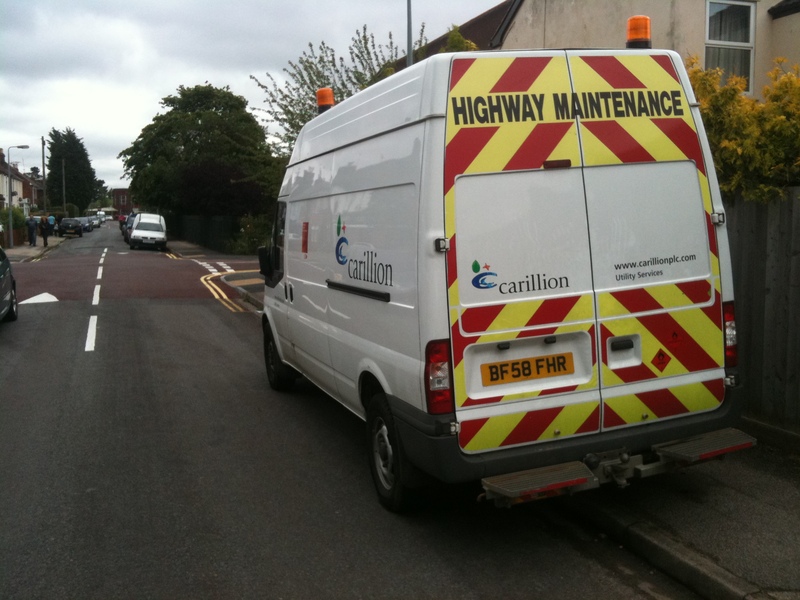 Residents requested further action be taken”. Needless to say, one does not need to go to Preston to find bins left permanently on the pavement. 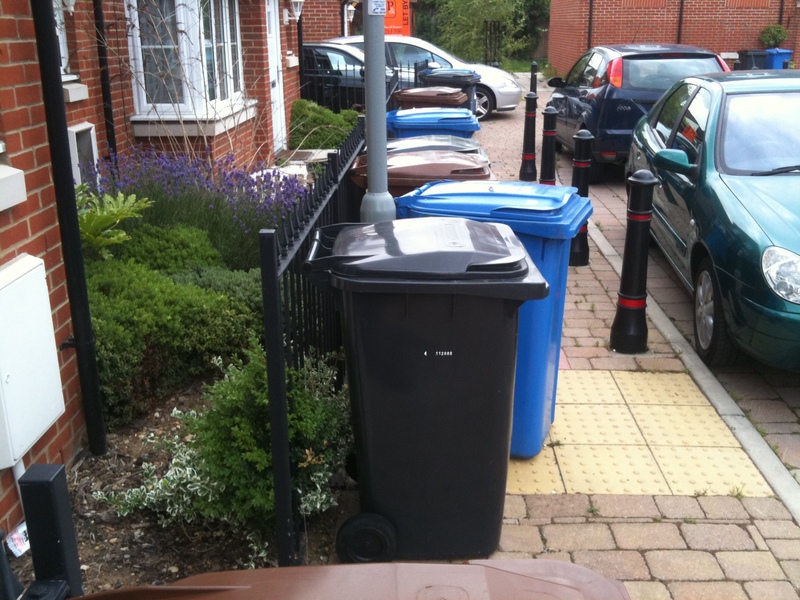 Notice that these people living in my home town have actually got space on where they could store their bins on their land but choose instead to keep them on the pavement where they get in someone else’s way and create a pretty little garden on their patch. It makes a mockery of the dropped kerb; notice also that the bollards which were put their to keep the pavement clear of parked cars are now making the pavement even less usable. My council have said that it would be too difficult to do anything about it and have not followed up my complaint with any letters or whatever. 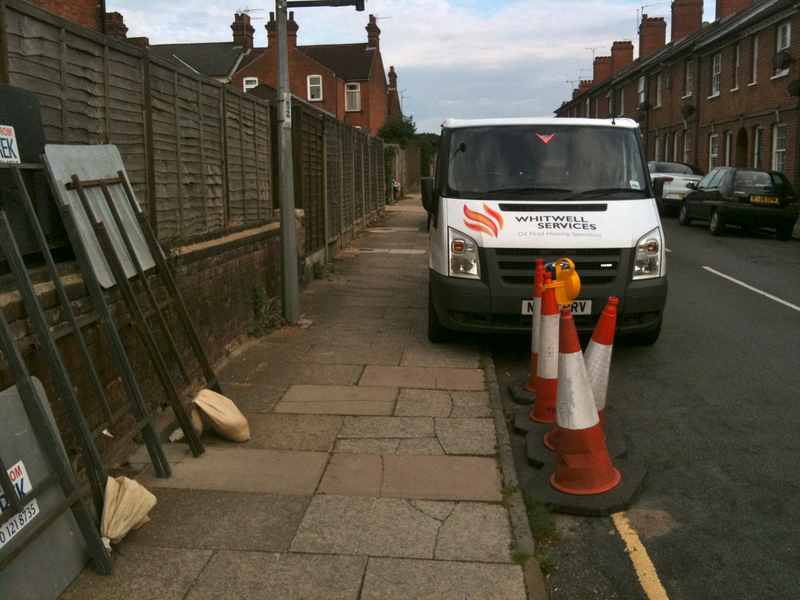 A trial ‘Cars Off Pavements campaign‘ at four parking hot-spots in Charnwood, a borough of 167,000 people in Leicestershire, led to a 75% reduction in pavement parking and is now going to be rolled out across the borough. The campaign is being run by Charnwood Borough Council, Leicestershire Police and the Royal National Institute for the Blind. Charnwood Borough Council street wardens will issue £50 Parking Charge Notices to offenders who park on pavements in contravention of the signs and lines. Police officers and PCSOs can issue fixed penalty notices to offenders who cause pavement obstructions.The local MP was out recently showing his support. Great to see such no-nonsense coordinated action on the issue!